There are three teaching methods that most writing workshop teachers use regularly. The star of these is the demonstration method. “Watch me as I do this helpful/interesting/important thing in my own writing. I’ll show you how, and then you can give it a try,” says the teacher. As a quick, fix-up teaching method or to fuel student writers with pointed tips as they work, explain and example works wonders. Likely many teachers use this method constantly without naming it. To help with the explain part of this method, simple graphic representations of strategies are often worth, well, more than 1,000 words. Consider popping a few of the below in your conferring toolkit or even making them on the fly as you work with kids. The image below shows a graphic designed to support elaboration and balance in narrative writing. When explaining that narrative writing often has a balance of dialogue, action, and thinking, the written words and image of a scale can solidify this concept for students. The visual also has pre-made examples to further help explain the idea. I can’t take credit for this next one. 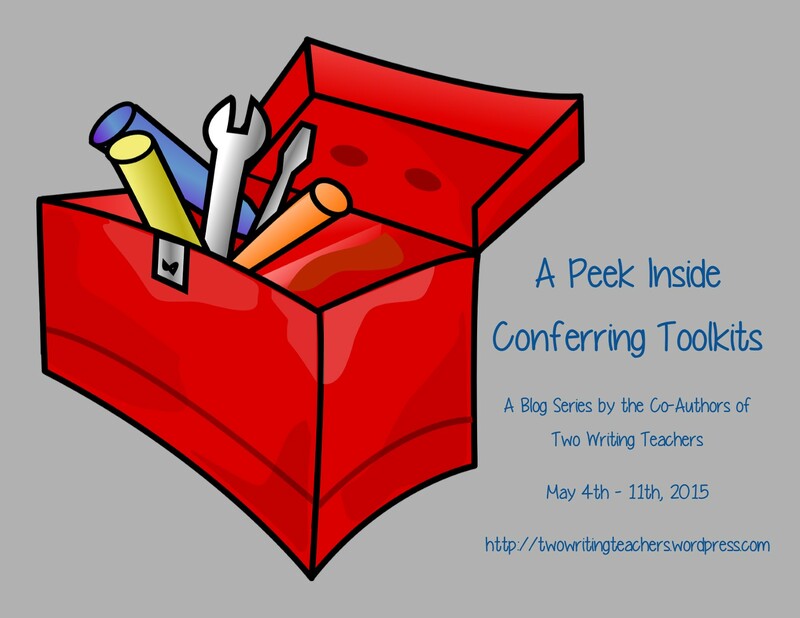 I got the idea from a clever teacher with a breathtaking conferring toolkit. With her class, she’d been working on character traits and feelings in reading workshop. They’d made a chart with lists of possible feelings and traits. The teacher wrote all of the feelings on cards, and used them to make a visual like this one. 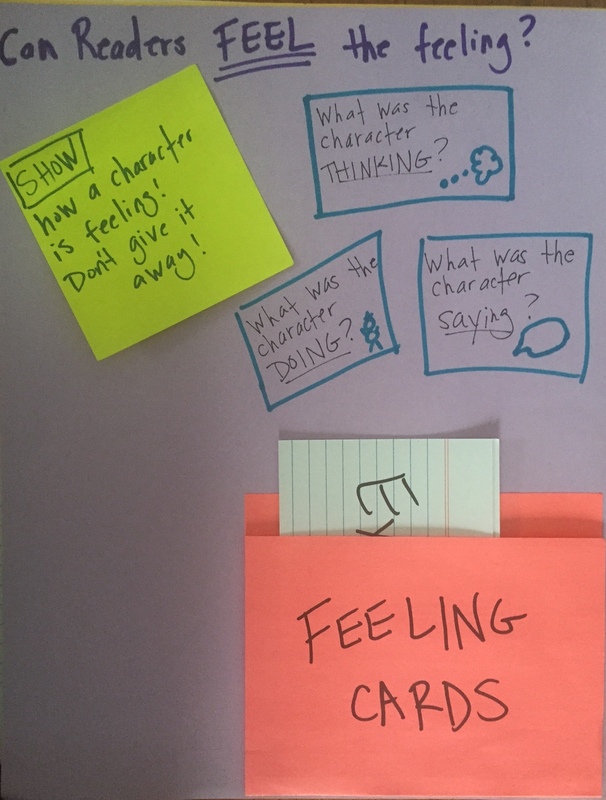 To help the kids with showing, not telling in their narrative writing, the teacher channeled kids to look through the feeling cards, then decide which one best matched what their character was feeling in a scene. They planned what the character might do, say, or think as a result of this feeling, then went off to write their ideas into their stories. Here are a couple of great visuals to support conventions in narrative writing. These could easily be altered for expository writing. 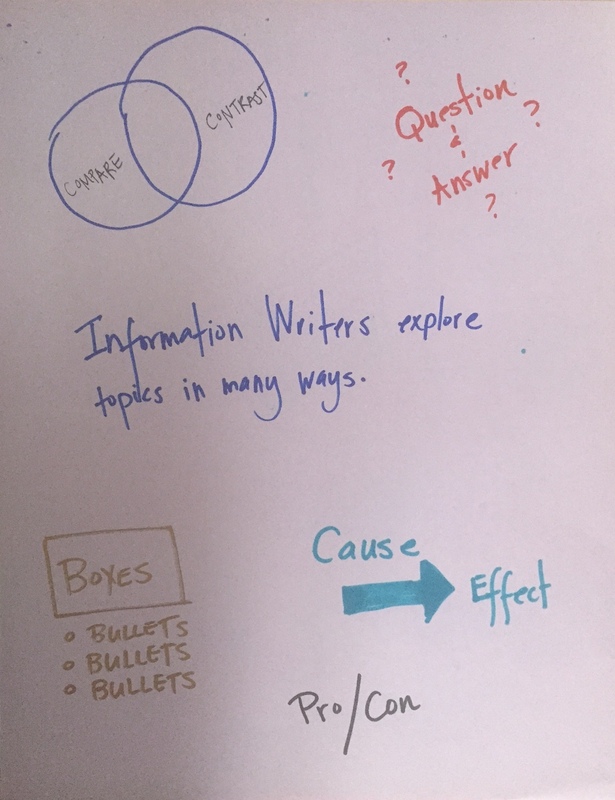 The following visual can support information writers in two ways. 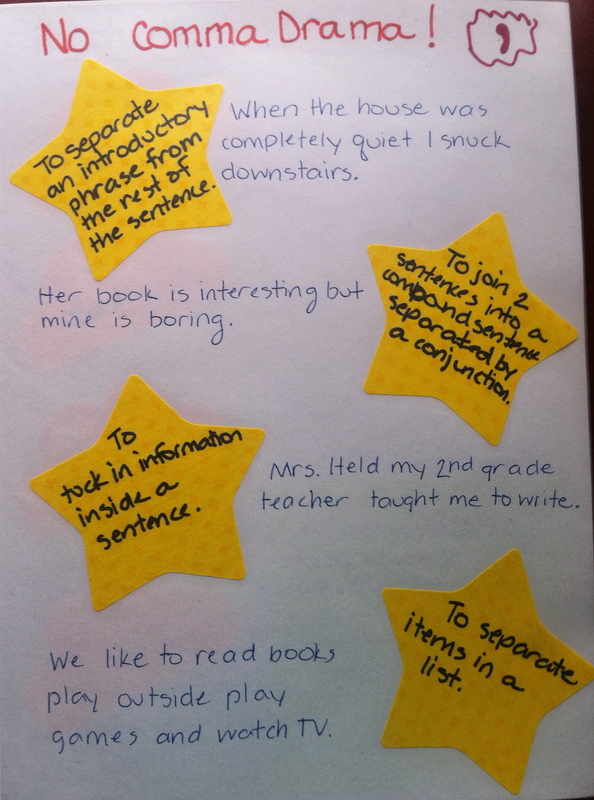 First, if a writer is exploring a topic toward the start of the writing process, perhaps by doing some flash-drafting, the listed structures can give the writer some ideas and entry points to help with this drafting. For example, she might compare two concepts within the topic, or compare the topic to a different topic to grow ideas. This visual can also support writers who are farther along in the writing process but who are struggling with elaboration. Using these structures to say more about a topic (or a subtopic) can be really beneficial. Note that this visual could be used to support opinion/essay writing as well. In this interactive visual, writers revise a sample table of contents, which can be much less daunting than jumping right to revising their own. 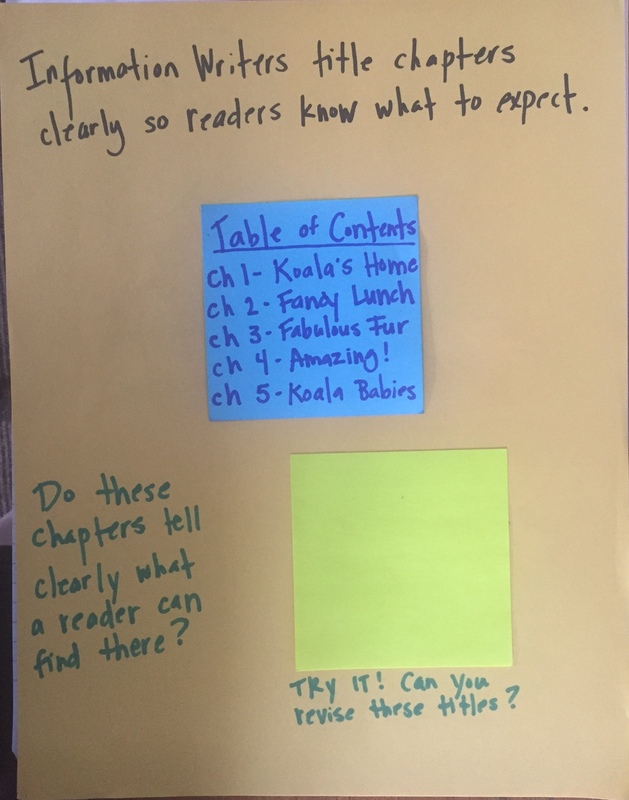 This visual certainly would help writers who need some support in doing the main idea work necessary to come up with apt and informative chapter titles. 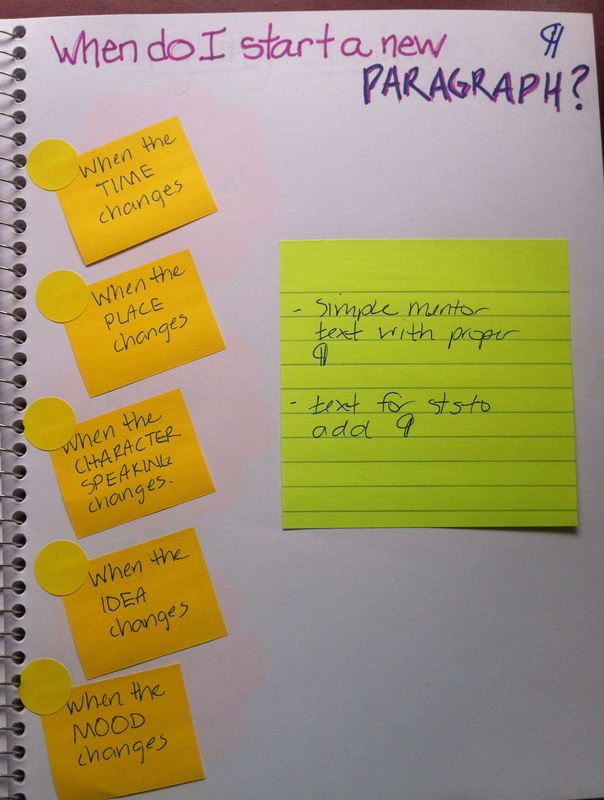 But using this visual could also help writers in another way – they might see that two of their chapters are too similar, or that they are missing a key chapter that would help to fully explain the topic. The possibilities for teaching visuals such as these are endless. We look forward to hearing about (and possibly seeing!) some of your favorites at our Twitter chat on Monday. Looking forward to hearing from you all in the comments sections of our posts and convening with you all on Twitter (May 11 at 8:30PM EST). Now I want to see ALL of your visuals! 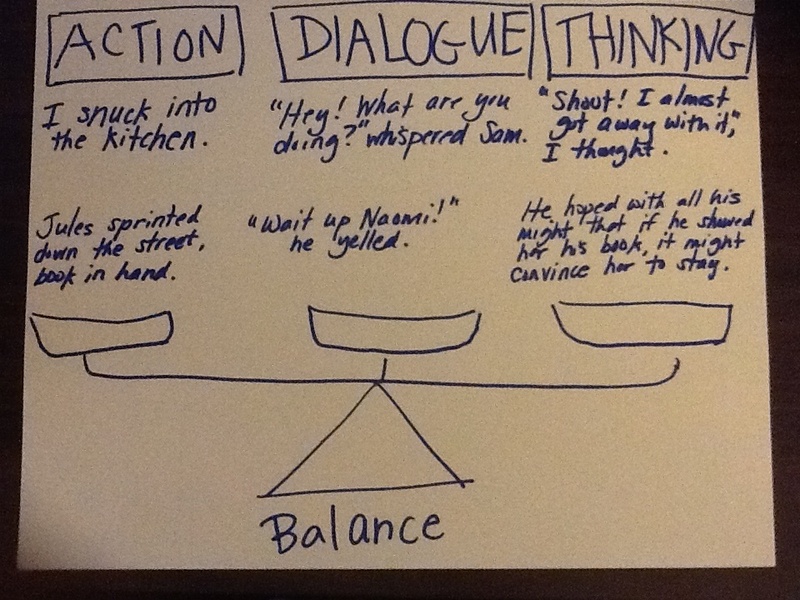 The balance is the one I keep returning to for the students who want to hang all their narrative elaboration on dialogue. I think this visual is ALSO perfect for teachers as they study elaboration across all writing genres. Thanks for including so MANY visuals. I, too, need to SEE examples to get the ideas to stick in my brain. Such a wonderful post in this series! Thank you for sharing all of these visuals. 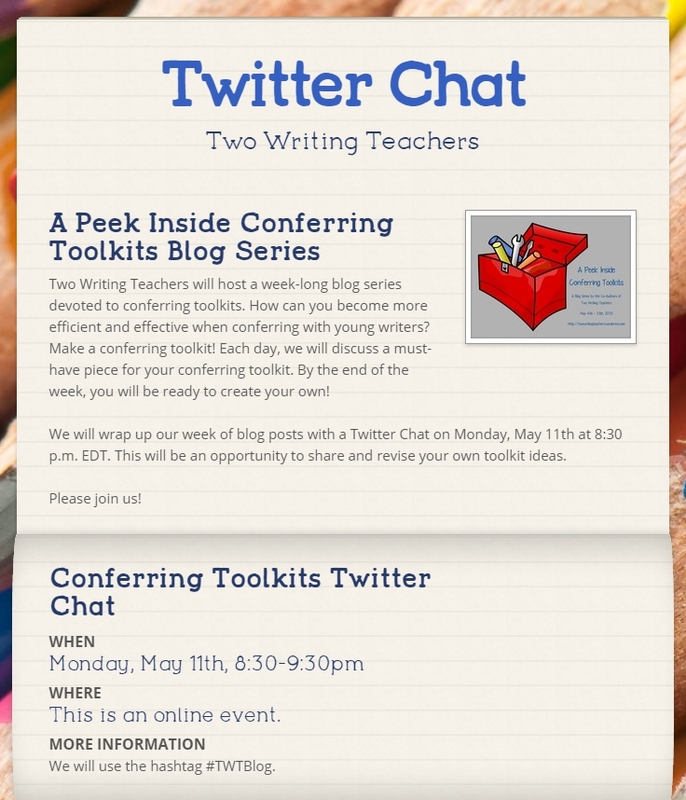 I am meeting with a teacher today to talk about conferring. This will help me build a toolbox with her. I loved all the visuals and detailed explanations. You help us grow, so our writers can soar! I love all of these visuals. I could’ve used a few of them today. I guess I’ll have to borrow them and tuck them into my toolkit going-forward. Vey helpful and the jpgs help me to see it. Thx.